How Many Security Regulations Apply to Your Company? Key Assessment: What Is the State of Control? What Are Measures and What Are Metrics? What Are the Key Objectives for Our Metrics? Why Measure? What Are the Benefits of Measures and Metrics? Where Do I Find the Data for My Measures and Metrics? 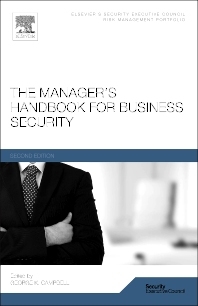 A very good guide for the new security manager or experienced one. Provides great level of detail to ensure your security program is operating to its best ability.